He’s the first guy in, last guy out. He plays with his hair on fire, plays every play like his last. Blue-collar, high-motor, brings his hard hat and lunch pail to work every day – Chase Winovich is all of that, all of the scouting clichés media and fans alike have been quick to label him as throughout the pre-draft process. But he isn’t just a walking cliché. Winovich ranked inside the top-10 in two-year overall grade (92.3) and pass-rush grade (91.2) among qualifying FBS edge defenders because he’s so much more than that. And he is eager to prove he’s, in fact, a rare combination of all the oft-used clichés and legitimate, translatable pass-rush ability. Winovich took significant strides toward stripping himself of lazy narratives when he ran a sub-4.60 40-yard dash and crushed the agility drills at the 2019 NFL Scouting Combine in February. Weighing in at 6-foot-3, 258 pounds in Indy, Winovich finished the series of athletic testing. Ranked fourth in the 40-yard dash (4.59s), third in the three-cone (6.94s) and first in the 20-yard shuttle (4.11s) among participating edge defenders at the Combine. All three times breached the 90th percentile at his position, per MockDraftable. Winovich’s surprisingly surgical pass-rush ability displayed on tape and further reflected in his grades and advanced stats also stands in favor of the argument that his game goes beyond his motor. In the play above, Winovich executes a first-rate push-pull move to beat the Notre Dame right tackle for the sack, one of several moves he leaned on in what was a spectacular 2018 season for the Michigan standout. Winovich this past season ranked 10th among the 104 FBS edge defenders with at least 300 pass-rush snaps in pass-rush grade (89.2). He also ranked fourth in pass-rush win percentage (21.7%) and eighth in total pressure percentage (16.7%). Surprising no one, Winovich doesn’t attribute his pass-rushing success to his motor or hard hat but rather the oft-overlooked mental aspect of rushing the passer and needed technique. “The biggest thing for a pass-rusher really is you’ve got to be on top of everything,” Winovich said. “You’ve got to be on top of the snap count, making sure you get a good get-off on the ball. You’ve got to be on top of knowing who you’re going against, knowing what your strengths are… It goes back to film study. It goes to what moves you’ve worked on in practice the week before. 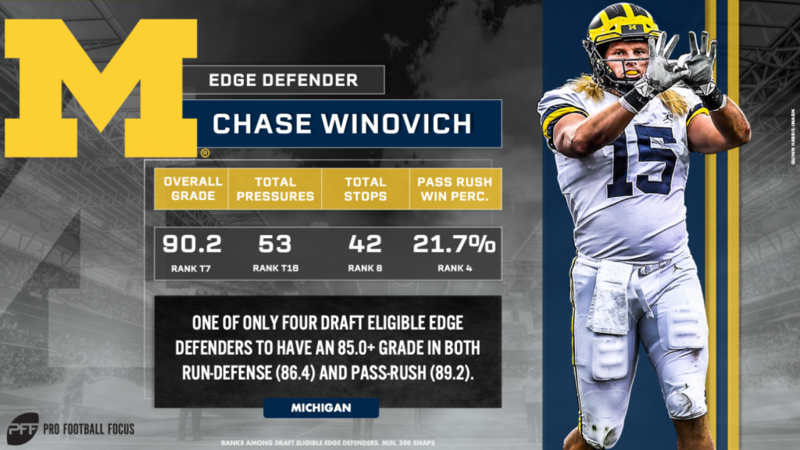 In just the past two seasons, Winovich has shown dramatic improvement in all the areas he speaks to, leading to his 88.3 pass-rush grade in 2017 and 89.2 pass-rush grade in 2018. Winovich’s two-year pass-rush grade (91.2) ranks tied for eighth among the 133 edge defenders with 400 or more pass-rush snaps since 2017. He ranks 12th in pass-rush win rate and tied for 18th in total pressure percentage, as well. And he has far from reached his ceiling. NFL teams praised Winovich’s leverage among other strengths tied to his pass-rush ability in meetings at the combine but were also eager to coach him up and build on his technique. He also said teams he had formal meetings with weren’t as shocked at his athletic testing as other teams were given what they’d seen on tape and liked him for more than just his motor – NFL interest in Winovich is gaining for the right reasons.